The Database Connection Properties dialog lets you configure particular properties of a database connection. In the dialog, you can choose a JDBC driver or an existing JNDI resource, set up credentials, transaction isolation level, etc. 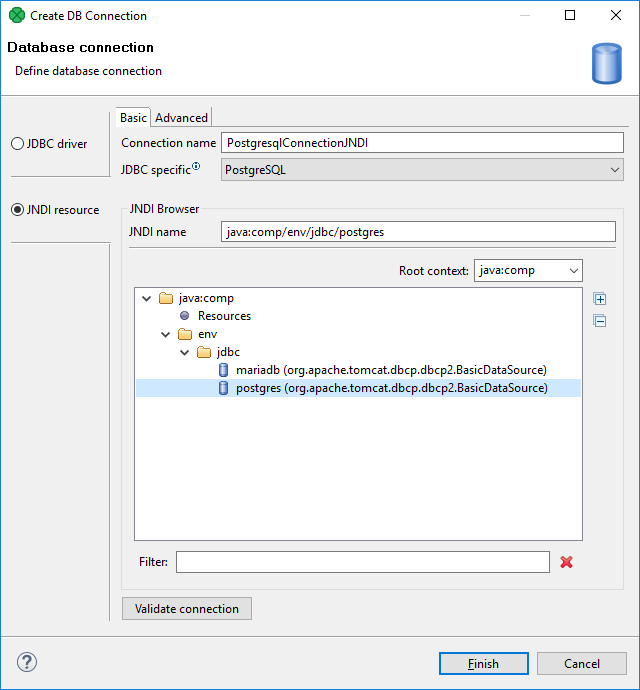 You can create a database connection that uses a user-defined JDBC Driver or a JNDI Resource. The dialog consists of two tabs: Basic properties and Advanced properties. 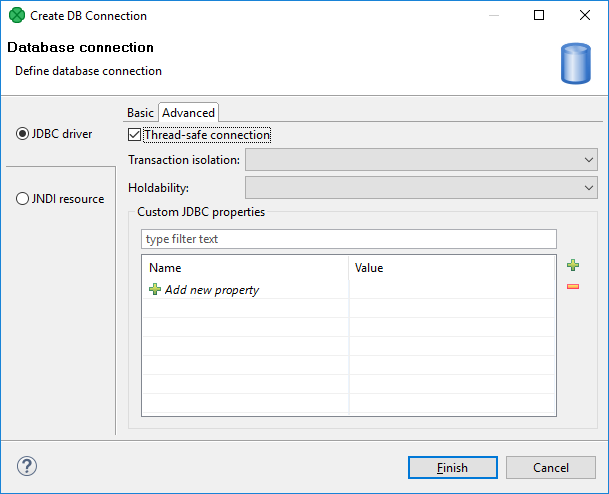 In the Basic properties tab of JDBC driver in the Database connection dialog, you specify the name of the connection, type your User name, your access Password and URL of the database connection (hostname, database name or other properties). The password can be encrypted using Secure Graph Parameters. The default JDBC specific can be used, but the specific one might suit your purpose better. By setting JDBC specific, you can slightly change the behavior of the connection such as different data type conversion, getting auto-generated keys, etc. Database connection is optimized according to this attribute. JDBC specific adjusts the connection for the best cooperation with the given type of database. You can also choose from the following connections built in CloverDX: Derby, Firebird, Microsoft SQL Server (for Microsoft SQL Server 2008 or Microsoft SQL Server 2000-2005 specific), MySQL, Oracle, PostgreSQL, Sybase and SQLite. After selecting one of them, you can see in the connection code one of the following expressions: database="DERBY", database="FIREBIRD", database="MSSQL", database="MYSQL", database="ORACLE", database="POSTGRE", database="SYBASE" or database="SQLITE", respectively. If you need to connect to ODBC resources, use the Generic ODBC driver. However, choose it only if other direct JDBC drivers do not work. Moreover, mind using a proper ODBC version which suits your CloverDX - either 32 or 64-bit. If you want to use some other driver, you can use one of the Available drivers. If the desired JDBC driver is not in the list, you can add it by clicking the sign located on the right side of the dialog (Load driver from JAR). Then you can locate the driver and confirm its selection. If necessary, you can also add another JAR to the driver classpath (Add JAR to driver classpath). For example, some databases may need their license to be added as well as the driver. CloverDX has built-in JDBC drivers for: Derby, Firebird, Microsoft SQL Server 2008, MySQL, Oracle, PostgreSQL, SQLite and Sybase databases. You can choose any JDBC driver from the list of available drivers. By clicking any driver, a connection string hint appears in the URL text area. You only need to modify the connection. You can also specify JNDI. Remember that CloverDX supports JDBC 3 drivers and higher. Once you have selected the driver from the list, you only need to type your username and password for connecting to the database. You also need to change the hostname to its correct name. Type the right database name instead of the database filler word. Some other drivers provide different URLs that must be changed in a different way. You can also load an existing connection from one of the existing configuration files. You can set up the JDBC specific property, or use the default one; however, it may not do all that you want. By setting JDBC specific you can slightly change the selected connection behavior such as different data type conversion, getting auto-generated keys, etc. Database connections are optimized based on this attribute. JDBC specific adjusts the connection for the best cooperation with the given type of database. Note that you can also remove a driver from the list in the Basic tab (Remove selected) and custom properties in the Advanced tab (Remove parameter(s)) by clicking the	Minus sign on the respective tab. The Generic ODBC driver reads data sources which are not directly listed in Available drivers (e.g. DBF). Click the Generic ODBC driver. Specify the dsn_source in URL. In Windows, this is what you can see in ODBC Data Source Administrator → User DSN as Name. Leave fields User and Password blank. In DBOutputTable, mapping of metadata fields to SQL fields cannot be checked. Make sure the mapping is designed correctly. If the mapping is invalid, the graph fails. You cannot set any transaction isolation level (a warning appears in the log). 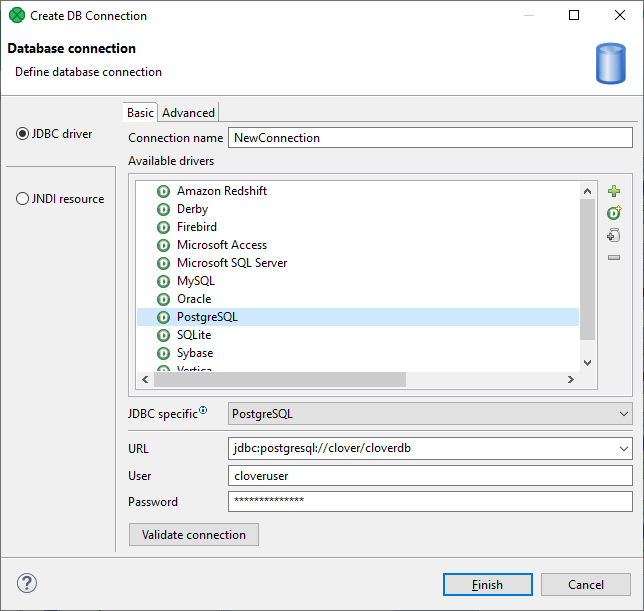 Choose Generic ODBC only if other direct JDBC drivers do not work. Even if the ODBC driver exists, it does not necessarily have to work in CloverDX (which was successfully tested with MySQL ODBC driver). Moreover, mind using a proper ODBC version which suits your CloverDX - either 32 or 64-bit. This driver internally uses the UCanAccess driver. CloverDX uses version 4.0.2. See the offical UcanAccess webpage. In DBOutputTable, long type cannot be used in input metadata. Consider using Reformat in your graph to convert long fields to other metadata types. boolean fields that are null will be actually written as false (null value is not supported). You cannot write null into binary fields, either. By default, CloverDX uses the singleconnection=true property of the UCanAccess driver to minimize usage of system resources. This default can be overridden in connection URL or in Custom JDBC properties. For more details on driver properties, see the driver's documentation. MS Access data type NUMBER with field size INTEGER corresponds to SQL_SMALLINT, which can only hold values between approximately -32,000 and +32,000. If you store any value that would overflow this data type field, UCanAccess driver does not report the overflow and saves overflown (incorrect) value. Check the value before insertion or use ODBC driver which can detect the error. Click Microsoft Access ODBC in Available drivers. URL - replace database_file with absolute path to your MDB file. In DBOutputTable, long and decimal types cannot be used in input metadata. Consider using Reformat in your graph to convert these to other metadata types. Use Microsoft Access driver to write decimals. This driver was renamed in version 4.0.7. The original name was MS Access. In addition to the Basic properties tab described above, the Database connection dialog also offers the Advanced properties tab. By default, it is enabled. 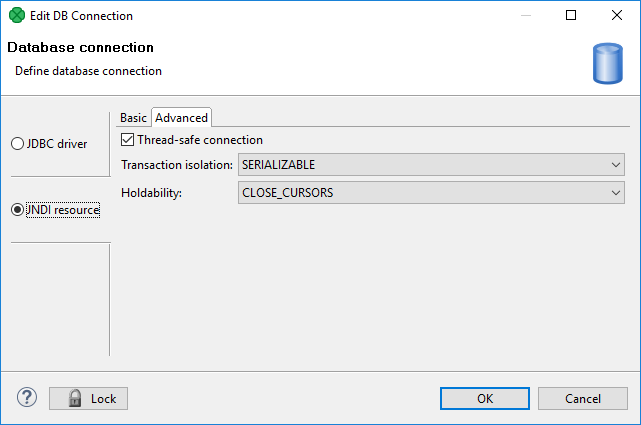 In this default setting, each thread gets its own connection to prevent problems when more components converse with DB through the same connection object which is not thread safe. This is the default value for DB2, Derby, EXASolution, Informix, MySQL, MS SQL Server 2008, MS SQL Server 2000-2005, PostgreSQL and SQLite specifics. This value is also used as default when JDBC specific called Generic is used. This is the default value for Oracle, Sybase and Vertica specifics. A constant indicating that dirty reads and non-repeatable reads are prevented; phantom reads can occur. This level prohibits a transaction from reading a row with uncommitted changes in it, and it also prohibits a situation where one transaction reads a row, a second transaction alters the row and the first transaction rereads the row, getting different values the second time (a "non-repeatable read"). A constant indicating that dirty reads, non-repeatable reads and phantom reads are prevented. This level includes the prohibitions in TRANSACTION_REPEATABLE_READ and further prohibits a situation where one transaction reads all rows that satisfy a where condition, a second transaction inserts a row that satisfies the where condition and the first transaction rereads for the same condition, retrieving the additional "phantom" row in the second read. The constant indicating that ResultSet objects should not be closed when the method Connection.commit is called. This is the default value for Informix and MS SQL Server 2008 specifics. The constant indicating that ResultSet objects should be closed when the method Connection.commit is called. This is the default value for DB2, Derby, MS SQL Server 2000-2005, MySQL, Oracle, PostgreSQL, SQLite, Sybase and Vertica specifics. In the JNDI resource tab, you can create a connection from an existing JNDI resource. JNDI is a configuration used to obtain a connection from a JNDI-bound data source. A data source generates database connections from a connection pool which is defined on the level of an application server. In Basic tab of JNDI resource, you can name the database connection and choose a corresponding database JNDI resource from the tree-view. Connection name is a user-defined name of the database connection. JDBC specific is described in JDBC driver. JNDI name is a name of a JNDI data source. If you choose a particular JNDI data source from the tree-view below, JNDI name is filled in. Root context allows you to choose root context of JNDI resource. You can choose one of the pre-filled values: java:comp, java:comp/env and <empty>, or you can add your own value: click the combo, type the value, and press Enter. To create a database connection, specify the Connection name and choose the database JNDI resource from the tree-view. If there are too many resources, Filter might help you. If you have configured JNDI resource but you cannot see it in the list, there can be a problem with configuration (e.g. typo or bad password) or the database might refuse the resource to connect due to limit on connections. You can enter the JNDI Name and use the connection to see the cause. The advanced tab of JNDI resource has the same configurable items as the advanced tab of JDBC driver. See Advanced Properties of JDBC driver.